A football club has apologised after fans reportedly made racist comments to the opposing team and released a smoke bomb. Fans of Torquay United FC are said to have made "monkey noises" while away at Eastleigh FC on Boxing Day. In a statement on the game, Torquay FC said: "Any perpetrator of racist abuse will be banned from the club for life, without exception." Eastleigh FC have not commented on the accusations. The match - which ended in a 1-1 draw - was played in front of 2,092 supporters at Eastleigh FC's ground the Silverlake Stadium, including 254 Torquay fans. In a statement, Torquay FC said: "The team is deeply concerned by recent reports of poor behaviour from a tiny minority of 'united fans'." 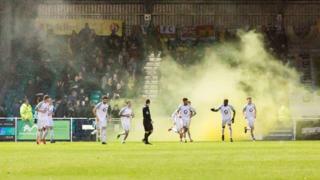 Describing the Eastleigh game as having a "tremendous atmosphere", Torquay FC general manager Geoff Harrop said he was "extremely sad to therefore have to apologise to Eastleigh for the release of a smoke bomb following United's opening goal". "Even more serious are the disturbing reports of racist comments being made by somebody in the away end," he added. "This will never be tolerated by any football club and Torquay United condemn this behaviour in the strongest possible terms. "On behalf of the club, we apologise to any Eastleigh player subjected to these disgusting comments and please rest assured that club officials are investigating the incidents as a matter of urgency." Football and racism: How are ethnic minority fans treated?